An aromatic Asian broth surrounds homemade buckwheat noodles in this comforting soup. Each flavourful spoonful is also healthy and gluten free, thanks to nutritious bone broth and magnesium-rich buckwheat. This month, in addition to fancier fare like clafoutis, I’ve intentionally shared more of my family’s favourite simple recipes. Tasty foods like Creamy Sweet Pea Salad and Paradise Fruit Salad appear on our table again and again in real life. Another of these go-to recipes, which hails from the Stephanie O’Dea, is Vietnamese Chicken. Seasoned with soy sauce, fish sauce, and garlic, everybody, including my 2-year-old, loves it! I serve Vietnamese chicken once or twice twice a month, but I’m sorry to admit I have not been resourceful with the savoury leftover broth. However, with Earth week happening, I decided to reduce waste and reuse the broth to make a delicious soup. I scoured the cupboard for some ancient buckwheat noodles to no avail. And thus my non-specific intention of making homemade buckwheat noodles from scratch came about very quickly. I chose buckwheat because it stands up well to the intense flavours of the broth; also, the noodles are sturdier than your average noodle, so they hold up well and can linger in the broth for a while without becoming soggy. This is not a special occasion soup. It’s a hearty leftovers-to-lunch soup that I can turn to whenever I have broth available. And if I don’t feel like making or buying buckwheat noodles, there’s always Vietnamese Chicken Noodle Soup with Ginger–another easy favourite. Do you ever turn leftovers into soup? I’d like to know what you use in your next-day soups. Blend together sweet potatoes and egg white with electric mixer until well combined. Stir in buckwheat flour and sea salt. Add more buckwheat flour until a dough forms that is not overly sticky. Divide dough into 4 sections, place in a covered bowl and chill for 20 minutes. Take the first section of dough and dust the surface of the dough with buckwheat flour. Lightly oil a sheet of parchment or wax paper and roll dough into an even layer, slightly thicker than a homemade tortilla. Cut into strips and gently separate them from one another. Heat broth to a simmer; add water and/or seasonings to adjust the saltiness. Bring another pot of salted water to a rolling boil and carefully transfer the first batch of noodle strips into the boiling water. Cook for 2 minutes. Use tongs or a fork to transfer cooked noodles to warm broth. Continue making the rest of the noodles and cooking them in batches. 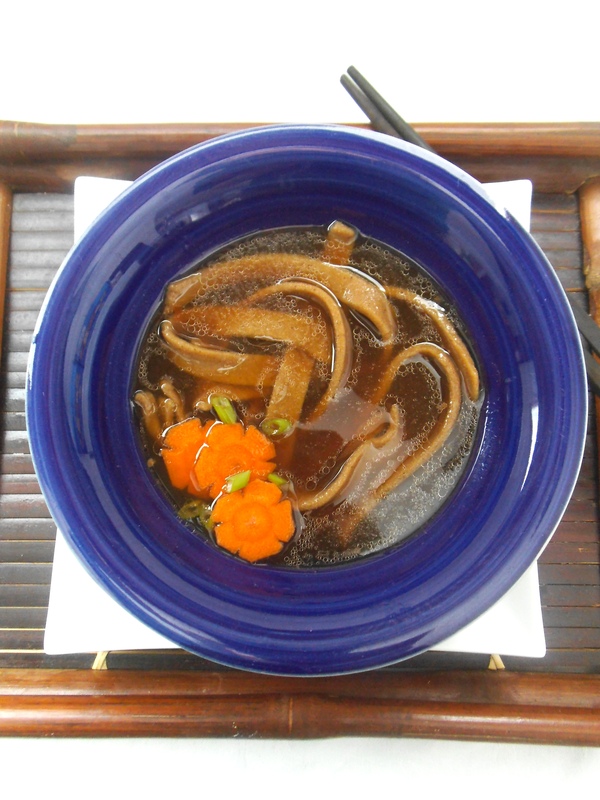 Ladle noodles and warm broth into bowls and garnish with carrots and green onions. Here is where I share recipes. Your recipe looks so delicious, Julia. I use leftovers to make soup all the time. Sometimes the combinations are a little strange but it’s a great way to use up bits of this and that in the fridge. I have some buckwheat flour left over from making crepes and I can’t wait to try your noodle recipe. It’s great that you are planning to make the noodles. I’d love to hear how they turn out for you! Mmmm!!! I’m going to have to try these noodles. Looks fabulous and so does the mexican lasagna recipe. those noodles look SO good! Can’t wait to try them! Featuring your recipe this week on AFW, thank you! A nod from you means a lot, Tessa. Thanks! I can’t wait to try these buckwheat noodles! I love the flavors you paired them with, too. Thanks! I thought they turned out well, considering I didn’t use xanthan gum. Is there a reason why you added sweet potato puree into your noodle recipe? *Also, how was the texture of this noodle? Since you did not add Xanthan Gum, did the noodles break apart or were they stiff? or did they come out pretty al dente? Thanks to the egg, they held together pretty well. Buckwheat noodles often include sweet potatoes. I just went with the flow, since I had purchased noodles with similar ingredients before.